This study aimed to describe the morbidity and mortality in older patients undergoing laparoscopic radical cystectomy (LRC) and compare the outcomes of LRC between octogenarians and younger patients (< 80 years) in a Japanese multicenter cohort. We identified 433 patients (80 octogenarians) who underwent LRC in a retrospective multicenter database from 10 institutions. The perioperative outcomes and the 90-day and late (> 90-day) complications according to the Clavien–Dindo classification were compared between the octogenarians and younger patients. Recurrence-free survival (RFS), overall survival (OS), and cancer-specific survival (CSS) were measured by the Kaplan–Meier method. Compared with the younger group, the octogenarian group included a significantly higher proportion of women, patients with a lower body mass index, patients with a lower preoperative albumin level, and patients with a history of abdominal surgery. The 90-day rates of all complications and major complications (grades III–V) were 50.0% and 20.0% among octogenarians and 54.7% and 16.4% among younger patients. The 90-day mortality rate among octogenarians was 3.8%. The 2-year RFS, CSS, and OS rates for octogenarians stratified by pathological stage was 95.2, 100, and 100% for ≤ pT1; 50.7, 76.6, and 56.1% for pT2; 33.6, 82.5, and 72.6% for ≥ pT3; and 23.1, 42.2, and 37.5% for pN + or distant metastasis, respectively. There was significant difference between octogenarians and younger patients only in 2-year OS for pT2 (56.1% vs 87.7%, p = 0.03). This study revealed that LRC can be performed for selected octogenarians with a complication rate similar to that of younger patients. Appropriate risk evaluation and modification of surgical procedures are necessary for octogenarians. The online version of this article ( https://doi.org/10.1007/s10147-019-01446-6) contains supplementary material, which is available to authorized users. 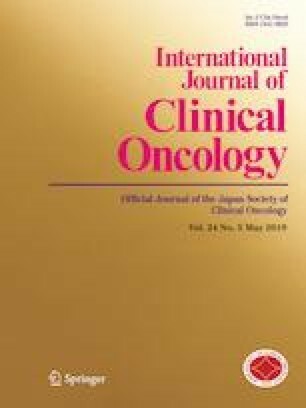 The authors wish to acknowledge the assistance of the following individuals in this study: Kazuhiro Okumura, Hiroaki Kawanishi, and Yuka Kono from Tenriyorozu Hospital; Mutsushi Kawakita and Masashi Kubota from Kobe City Medical Center General Hospital; Noriyuki Ito and Yosuke Shimizu from Nishikobe Medical Center; Toshiyuki Kamoto and Masato Fujii from Miyazaki University; Tomomi Kamba and Kenichiro Tanoue from Kumamoto University; Yasumasa Shichiri and Akihiro Hamada from Otsu Municipal Hospital; Toshiya Akao and Noboru Shibasaki from Rakuwakai Otowa Hospital; Seiji Moroi and Go Kobori from Hamamatsu Rosai Hospital. No author has any conflict of interest.